Between headline, copy, visual, tagline and logo, the intended message of an ad can be lost. To be simple and direct, and to make an impression on viewers, accomplished ads have shown that reductionism is key. These ads choose one or two elements and make them powerful on their own, but not so much so that they clash with or overlap the others. 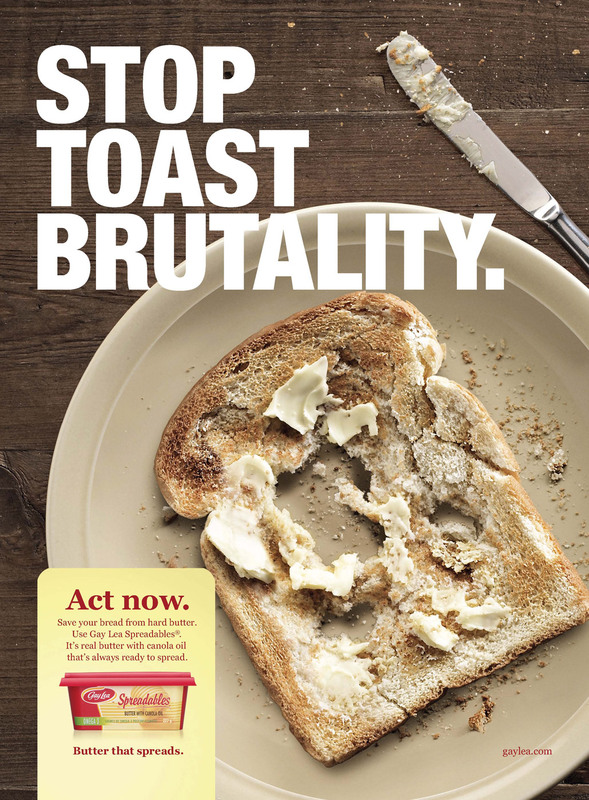 This ad for Gaylea spreadable butter is interesting in its execution, using a strong image to draw in butter-using and toast-eating readers. The unusual headline, especially with the word “brutality,” is definitely an attention-getter, but the awkward yellow square at the bottom left is unnecessary and repeats the ad’s idea multiple times. Just the headline, the visual, and a picture of the butter container that says Spreadables would have gotten the “Butter that spreads” idea across more succinctly.